Ideologi penerjemahan adalah suatu pandangan penerjemah dalam menerjemahkan teks. Penerjemah bisa condong ke salah satu dari dua ideologi yaitu domestikasi atau foreignisasi. Berikut pengertian ideologi, ideologi penerjemahan, serta perbedaan domestikasi dan foreignisasi penerjemahan (versi Inggris). Ideology is a principle that its truth is accepted and believed by a community in society. According to Barthes (1957) ideology is a myth which has been steady in a community. Myth itself is defined as an understanding of a culture symptom that has been steady. Ideology of translation is a principle or conviction about “right or wrong”, or “good or bad” in translating, it means that a translator has to think about the finest translation for source language’s readers and the most suitable and likeable translation for society. Ideology which is “right”, “acceptable”, and “good” for readers is an ideology that complies with certain requirement. In this case, Venutti (1995) analyzes that there are two ideologies which are contrary. The first is ideology which the orientation is the target language. It agrees with the expectation and taste of the readers who want textual translation that suitable with the culture of target language. The point is the output of translation should not be felt as a translation. It must be fluently read based on written tradition. For example, Mrs., Miss., and Mr. must be translated as Bapak, Ibu, and Nona. It is also applied in translating literary work or story for children; it must be served as original story and can be accepted as a part of our original culture not as a foreign thing. According to Venuti, transparency is rewriting them (source text) in the transparent discourse that prevails in English and that select precisely those foreign texts amenable to fluent translation. It’s connected with the economy that supported by taste building of politic. By political transparency (economical power) foreign works are domesticated and assimilated. Therefore, the cultural values of source language become “faded”, Venutti describes it as “imperialistic abroad and xenophobic at home”. This is applied in translating cultural texts such as literary text, political text, religious text, and philological text. Therefore, when we connect it with V-Diagram (Newmark), the method which used is method that aim at target language, started from adaptation (the one furthest from source language), then approach to the source language by free translation, idiomatic translation, and the furthest from target language is communicative translation. Nida and Taber say that a good translation is acceptable for target language. They call it as “transparency” and “domestication”. According to the supporter of this ideology, there are 3 key-terms; those are fluency, transparency, and domestication. Another ideology is ideology which the orientation is the source language. A translation that is “right”, “acceptable”, and “good” is suitable with the taste and expectation of the readers and also publisher who want the existence of source language culture or for readers who think that the foreign culture will be useful for society. This kind of translation is based on micro concept such as “transference” and ”decenttering”, and for the ideology is “foreignization”. 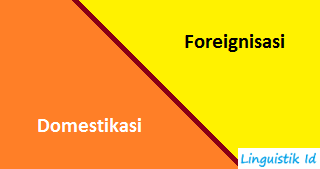 Foreignization ideology by Venuti is an ethnodeviant pressure on those values to register the linguistic and cultural difference of the foreign text, sending reader abroad. It means, according to V-Diagram by Newmark, the method which used is faithful translation and semantic translation that the orientation is the source language. For example, in translating English text we have to keep using greeting like Mr., Mrs., Miss, so the reader can feel the atmosphere of the source language culture. Those foreign words which still used can we called as “Cultural Index”. The purpose is the readers can enrich their knowledge by reading something foreign. In other words, it is a form of foreignzation ideology by transference: translating with preserving source language values. To sum up, there are two ideologies which are contrary. The first is ideology which the orientation is the target language, and the second is ideology which the orientation is the source language. Ideology of translation can affect to the process of cultural development in a society. Moreover, it can encourage the effort of economy publishing. 0 Response to "Perbedaan Ideologi Penerjemahan (Domestikasi dan Foreignisasi)"